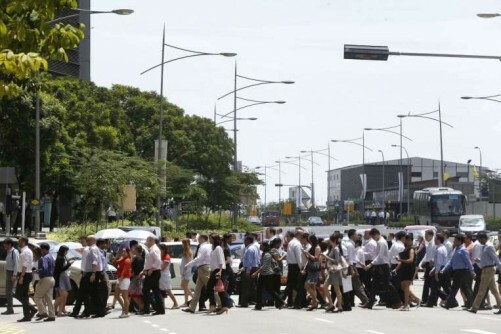 SINGAPORE - The number of people employed in Singapore fell in the first half of this year. This brought the total number of people working in Singapore, excluding domestic helpers, to 3,627,500 as at June. There were fewer Singaporeans and permanent residents in jobs, while the growth in the number of foreigners who were employed continued to slow. The tight labour market pushed up wages last year, but more slowly than in 2013 . From January to June this year, total employment, excluding domestic helpers, saw a net fall of 1,000, compared with the growth of 52,200 in the same period last year. The decline was led by an 8,900 fall in the number of Singaporeans and permanent residents in jobs, largely due to casual workers below the age of 25 leaving the workforce, said the Ministry of Manpower (MOM) in its half-yearly labour market statement on Tuesday. Excluding the domestic helpers, foreign employment growth slowed to 8,000, the lowest half-yearly growth since the 2009 recession. Barclays economist Leong Wai Ho said that the slowing down of foreign workforce growth numbers showed that tightening measures are working. "We are halfway through adjustments and we can't make them too dramatic," he said, adding that the locals who left the workforce could have been young real estate agents affected by the property cycle downturn. A bright spot was that real median incomes for full-time employed Singaporeans grew in 2014 by 1.4 per cent compared with 4.7 per cent in the year before. Low-wage workers saw their incomes grow by 2.1 per cent for those at the 20th percentile. But the gloomy picture continued on the productivity front, with all three sectors -manufacturing, construction and services - seeing declines in the first half of this year, though in total the decline was smaller than in the second half of 2014. Productivity in these sectors fell by 2 per cent, 0.1 per cent and 0.2 per cent, respectively. The MOM does not expect overall productivity growth to see a significant rise this year. Recruitment firm Kelly Services' acting country general manager Foo See Yang said much of the lacklustre employment data is due to the volatile global market. "In general, we expect firms to take a cautious approach to hiring until the uncertainty in the global market subsides," he said.